Just before the Battle of Bunker Hill, British soldiers occupied Copp's Hill, and found sport in firing muskets at the gravestones. Their favorite target was that of Daniel Malcom, a sea captain and Patriot that greatly opposed the Revenue Acts. The Americans considered the Revenue Acts "taxation without representation." The bullet holes are clearly visible in several place on Malcom's gravestone. In 1768, Malcom's boldest exploit was the clandestine landing of a cargo of wines without paying the duty. During the night, a vessel anchored at one of the islands in the harbor. About 60 casks of wine were brought ashore, and guarded by bands of men armed with clubs. The casks were spread about the town. Soon after this event, a meeting was held by prominent traders and merchants, and it was resolved that no English goods, other than those used in the fishing industry, would be purchased from England for 18 months. 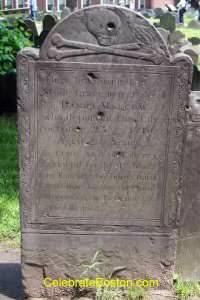 "I DANIEL MALCOM, of Boston, of lawful age, do certify and say, that on Friday the 10th day of June, 1768, being in my store of John Hancock, Esqr's wharf, about sunset, I saw Mr. Harrison, Collector, Mr. Hollowell, Comptroller; Mr. Sheaf, Deputy-Collector, with a number of inferior officers, pass my store and go down the wharf, and I, the said deponent, went down after them, and saw Mr. Hollowell give a signal to the Romney man-of-war, commanded by Captain Corner, which lay about a table's length from the wharf; on which the boat came from said man-of-war, and came a breast a sloop lying at said wharf; said Hollowell pointing with his hand to the said sloop, on which the master of the man-of-war, who was in the boat, boarded her immediately, with a number of marines, having their guns and other arms. I was then along side the said sloop, and heard said master of the man-of-war give orders to fix bayonets and take their places, and that the first damned rascal that said a word to blow his brains out, or run him through with the bayonet. With that I said you are a rascal to give such orders, when you see no persons opposing you, there being at that time but three or four men, besides a few boys near the sloop, except the custom-house officers, and man-of-war's men. It bring then sun-down, one of the marines, being ordered by the officer, fired a gun, when there came another boat along side said sloop, and Mr. Hallowell ordered said sloop's sails to be cut or cast off, and to tow her away; with that the said master of the man-of-war began to cut the sails, and Mr. Hollowell said, let me see who dare to oppose. I told him it looked like robbery, to take away a gentlemen's vessel in that manner, but he swore by God she should go. As I knew Mr. Harrrison to be a superior officer to him, I applied to him as he stood next to me, and said, Mr. Harrison, by whose orders does the officers take away the sloop; he replied by mine. I answered, if the sloop had broke any act of trade, cannot you seize her, and let here stay where she is (and take her trial to the Court of Admiralty) as she is as safe here as with the man-of-war, and I will take upon me to insure her forthcoming if you are afraid, or a least should be glad you would give orders to the officer to detain her till the owner, Mr. Hancock, comes down, as he is sent for, and will be here in a few minutes, for I am afraid it will make a great disturbance in town, as I think your proceedings are contrary to law, for I think you have done your duty when you seized her; but, Mr. Hallowell answered, I'll be damned but she shall go, and so cried out to the officer cut all way, when he cut away the sails, said Hallowell casting off some of them himself; when said officer had cut away all the sails, the boats towed her away, off to the man-of-war, and aid master of the man-of-war breathing out threats against the town, and swore he would send them all to hell; and he the said master several times ordered the marines to fire. After this was done, a few [blacks] and boys gathered round Mr. Hallowell, and told him that he had been the means of robbing a gentlemen of his interest, and so made a good deal of disturbance, following him up the street; and night coming on they went to said Hallowell's house, and broke a few panes of glass there, and to Mr. William's, and broke there, and got a small boat belonging to Mr. Harrison which they burned, and further the deponent sayeth not. Daniel Malcom." By 1770, tension over boycotts and smuggling finally erupted, and contributed to the killing of Christopher Snider, and then the Boston Massacre.